Oliver Curd’s young life was cut short, following a long courageous fight against cancer, in November 2007. He was just nine years old. 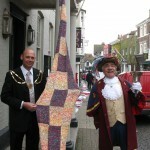 On Saturday 19 April an amazing knitted scarf was rolled out on the pavements of the streets of Rye. It reached from the Landgate Tower to The Strand, a distance of 805 yards or 2,415 ft. A knitting expert worked out that there would be around 28 million stitches. 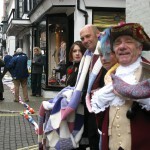 The original hope was to reach along the length of the High Street but with the Northiam Willing Fingers Group working until their needles were almost melting with the heat and help in the form of six inch blanket squares arriving from all over Britain, the aim of the longest scarf in Rye was upgraded and now some are wondering could it be the longest scarf in the World? 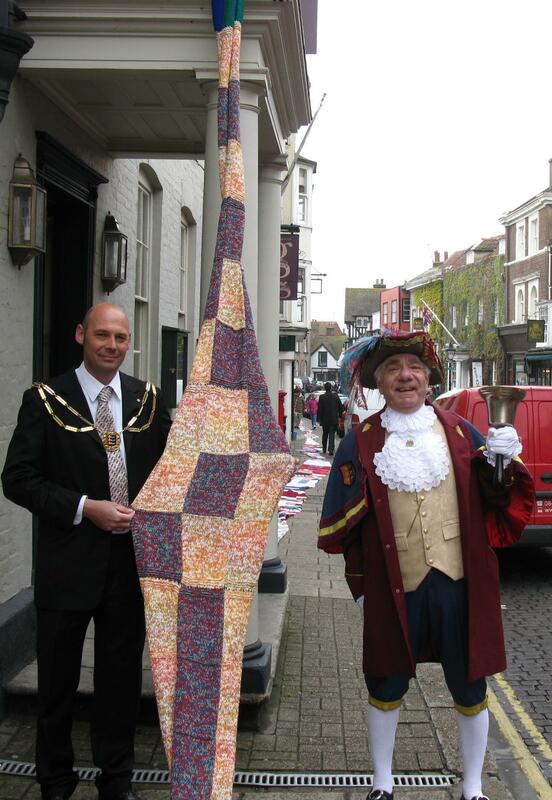 The scarf will be dismantled and made up into blankets which will be given to a charity. Oliver would have been proud of all the people, inspired by his brave struggle, who had contributed to the spectacular effort of knitting such a magnificent tribute to his memory. The knitters, led by Oliver’s grandmother Fay Curd, raised money that will be added to that of all the other funds raised in a variety of ways, including sponsored events like the recent Hastings Half Marathon when the Cur d family and friends ran accompanied by a Dalek (Oliver’s favourite programme was Doctor Who). The Oliver Curd Trust is a charity which has been set up by Oliver’s parents, Richard and Sarah Curd, in Oliver’s memory to help other families affected by childhood cancer. Oliver was diagnosed with a rare bone cancer, Ewings Sarcoma, in April 2006. He completed treatment at The Royal Marsden Hospital in March 2007 but unfortunately relapsed in June 2007 and lost his long, brave fight with the disease in November of that year. 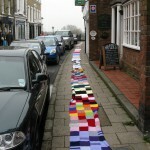 For almost half a mile the hand knitted scarf wended its way through Rye. From the Strand via the Mint, High Street and Tower street to the Landgate and beyond. 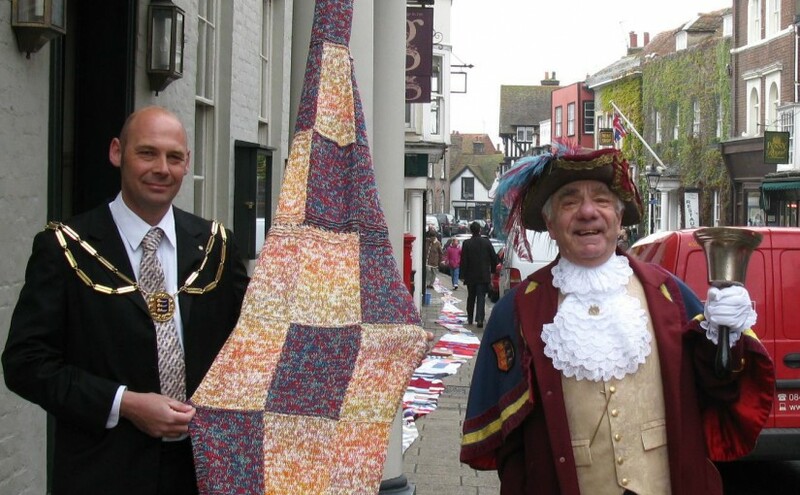 The Mayor of Rye, Councillor Paul Osborne and Town Crier Rex Swaine were present for the occasion. Paul’s term of office is running out, this was one of his last engagements.